When a British man lost his life to cancer before he could go on a fishing trip with two friends, they knew he wouldn't want to miss out. So when Paul Fairbrass and Cliff Dale traveled to Jurassic Mountain Resort & Fishing Park in Thailand earlier this month, they took Ron Hopper's ashes with them -- in the form of fish bait they named "Purple Ronnie." And they used that bait to catch a big fish in his memory. "Fishing from late Ronnie's favourite peg where he caught a 154lb carp a year earlier, Cliff now caught a much bigger carp in commemoration of Ronnie," the park wrote on Facebook. 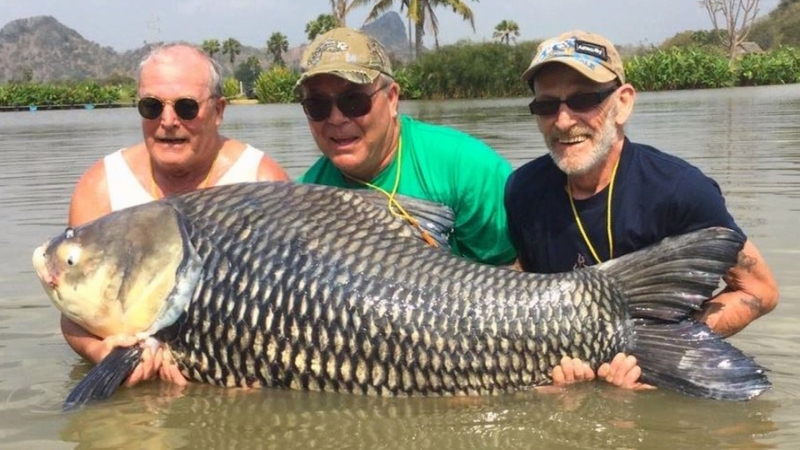 The friends posed with the 180-pound Siamese carp in a photo, which the park shared to Facebook. The two men had "honored him to the highest level," the park said. The fish was released unharmed. The three friends had taken a previous trip to the fishing park in February 2015. They booked another trip for this month, but Hooper passed away three days before Christmas. Before the trip, Dale wrote online: "Paul and myself will be there not just in memory of Ron but to enjoy the best fishing on this planet. "Tight lines Ron -- I'm sure you will be looking down on us having good fishing on the best lake in the world."